More than 2,000 Puffins are estimated to be nesting on the island of Fidra in the Firth of Forth this spring, following years of work to remove an invasive plant. The island, an RSPB Scotland nature reserve in East Lothian, had been overrun by Tree Mallow, which was probably planted by lighthouse keepers in the 1700s for its medicinal qualities and as a kind of 'grow-your-own' toilet paper. Tree Mallow is native to southern England and Continental Europe, but has caused huge problems for Puffins and other seabirds on islands throughout the Firth of Forth. RSPB Scotland's Allison Leonard, who is the warden of Fidra, said: "Tree Mallow in the Forth is a bit of a mystery. It sat quietly for years and then suddenly started spreading rapidly, possibly due to warmer temperatures associated with climate change, or with the level of nutrients in the soil. "It quickly became rampant and caused real problems for the Puffins, as it blocks the entrances to their nest burrows. 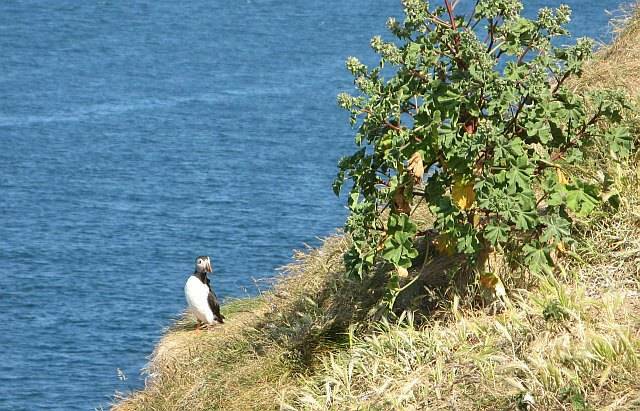 In 1996, Puffin numbers on Fidra dropped to a low of only around 400 occupied burrows. This year, we've got over 1,000 burrows occupied, so it's really good to see them bouncing back after all the hard work." The work on Fidra was carried out by RSPB Scotland staff and more than 20 volunteers as part of SOS Puffin, a Tree Mallow removal project run by the Scottish Seabird Centre in North Berwick, East Lothian. RSPB Scotland will be leading guided boat trips into the Firth of Forth this summer, in partnership with the Maid of the Forth. The trips will run on 5 and 26 June from South Queensferry. A one-off trip with Seafari Adventures from North Berwick will run on 9 July, when the boat will travel right past Fidra. All the cruises will provide lots of opportunities to see Puffins, Northern Gannets and other marine wildlife. For more information visit www.maidoftheforth.co.uk and www.seafari-edinburgh.co.uk.